This versatile Starter Kit Box is made in Natural Alder wood and fitted with two brass closure clasps and a sturdy black carry handle. Attractive and lightweight, these carry cases will hold a mixture of both small and large essential oil bottles. Internally the box has three compartments. 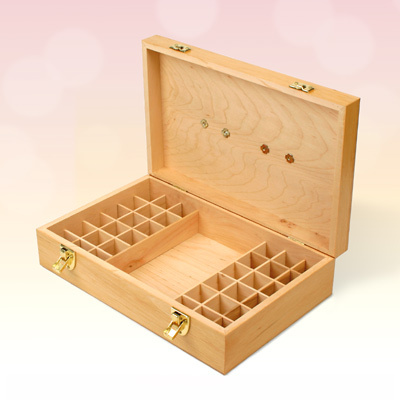 The 5 or 10ml essential oil bottles are stored either side and held within 18 retaining dividers. Larger sized essential oil bottles, carrier oil bottles or jars of cream can be stored in the open central area. Holds 36 x 5ml or 10ml bottles plus 5 x 50ml bottles. Accepts oil bottles up to 28mm diameter and 65mm height.